Guys, there are times that I curse being a Grown Up and having a Real Life Job that stops me drinking beer 24/7 and THIS is one of those times. 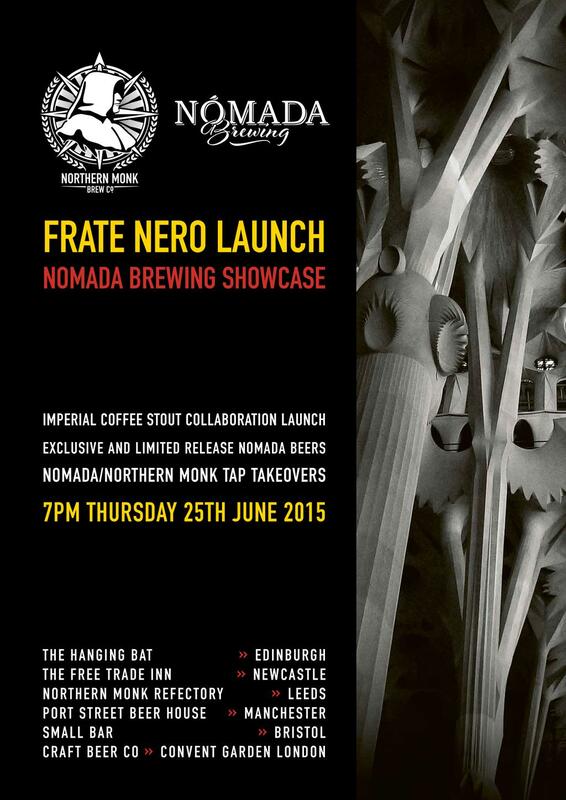 Leeds’ Northern Monk brewery has teamed up with Nómada of Sabadell, Spain, to create Frate Nero, an Imperial India Coffee Stout brewed with Sidamo Ethiopian coffee and oats. The 9.5% ABV Frate Nero will be pouring on keg and also in bottle. To mark the new drink the event will feature the collaboration beer along with one keg apiece from each of the breweries, plus an extensive range of exclusive and limited Nómada bottles that have been imported by Northern Monk, to showcase not only the efforts of one of the North West’s favourite breweries, but also a selection of rare, exciting Spanish beers. Passion fruit? Papaya? *weeps real tears* If you do manage to get down there, please tweet, take photos, drink it and let me know what I’m missing out on! If there’s anything left in Covent Garden by Saturday I’ll be down there with jangly bells on.